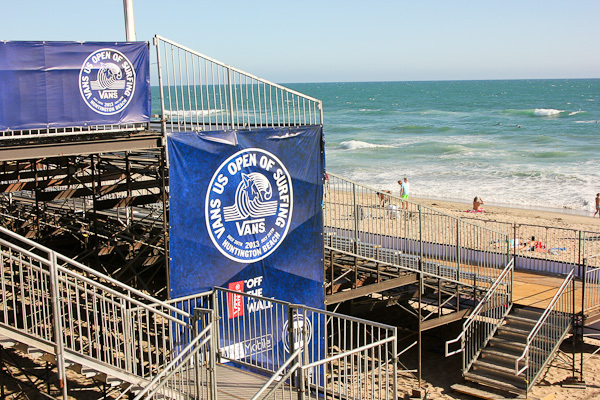 Vans U.S. Open of Surfing kicks-off today in Huntington Beach and runs for nine action-packed days, July 20th-28th. For the past two weeks, the golden sand north and south of the pier has been covered with stacks of steel that rise like a phoenix transformed into a gleaming modern spectator arena and Pacific Coast Highway was lined with utility trucks running the lines that will power the massive tent city and broadcast this mega event to the world. 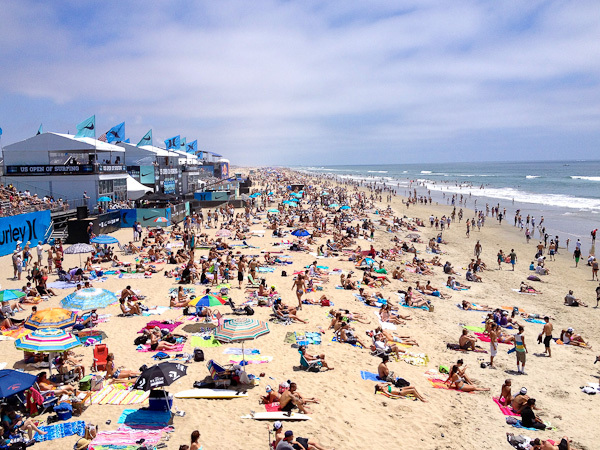 Previous high profile sponsors Nike, Hurley, and Converse have elevated the event to worldwide prominence attracting the biggest names in surfing and drawing up to 1 million fans and onlookers (yikes) along the 14-acre stretch of sand on the south side of Huntington Beach Pier. This year the site expands to 17 acres and includes a concrete bowl constructed for the first Van Doren Invitational BMX Bowl and an adjacent public skate bowl. Vans returns to their Orange County surf culture roots and will continue showcasing the best in surf, skate, music, and art while bringing a more family-friendly atmosphere to the festival. There will be movie nights featuring newly released and classic surf movies. One cool aspect about the U.S. Open has always been how accessible the athletes are to the fans and there are autograph signings scheduled throughout the event. Free concerts will be on Thursday and Friday instead of the weekend to keep the crowds manageable and focus on the fact that the U.S. Open is a world-class sporting event and a unique youth culture happening with a safe and family-friendly environment. Pro surfers, skaters, BMXers, and fans all must eat to keep their energy up, so that’s what I’m talkin’ about here. As a local of twenty-five years I want to give a shout out to a few of the restaurants that I like to frequent. Let’s start with brekkie. Downtown Huntington has much to offer in the way of breakfast to fuel the appetites of regulars and visitors and replenish calories burned after a morning of shredding the waves or popping ollies. 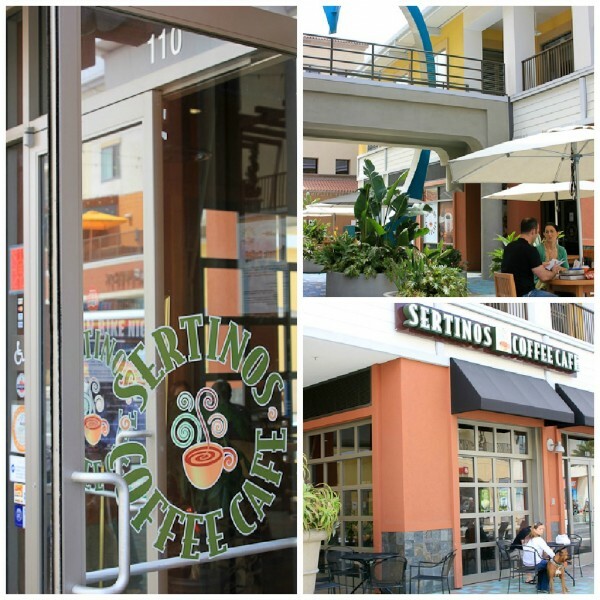 Venture from your Starbucks routine and try one of the organic hand-roasted brews at Sertino’s Cafe instead. Just one block off Main Street is 5th Street where you can find a bevy of delicious eats and a little less jostling for some sidewalk. Plus, there’s great shopping from Forever 21 to unique boutique stores and a relaxed vibe that you won’t find among the crowded bars and mass of humanity along the main drag. Sertino’s Coffee Cafe – no lines (OK, during the Open it’ll at least be a shorter line) as well as a better view and croissants, pastries, and bagels, or, if you slept in and its lunch time, premium deli-style, hot toasted Panini (huge) sandwiches and healthy salads. 150 5th Street, (714) 969-4888. 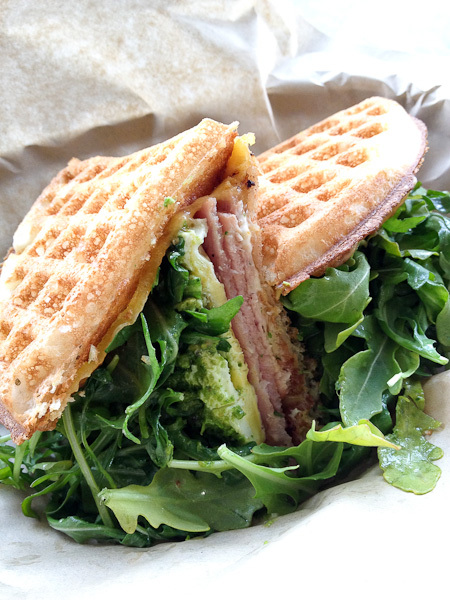 Update 7/1/14 – unfortunately Sertino’s has closed, I suggest the BOLD blend at Bruxie just up the street. 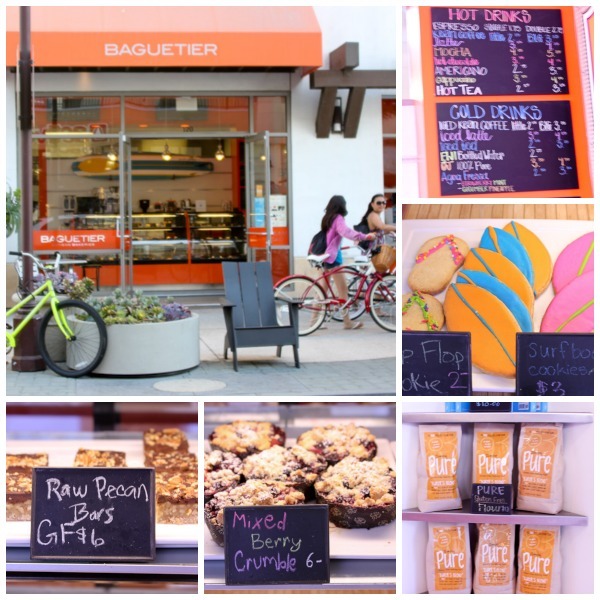 Next door to Sertino’s is Baguetier on 5th Street where Simply Layered brings you mouthwatering muffins, cookies, and sweet and savory pastries including gluten free and raw selections. Their java is local independent micro roasted, organic and fair trade Kean coffee and their specialty gluten-free flour is available for purchase. 120 5th Street, (714) 969-1700. Update 2/1/17 – Shakeaway – American-style milkshakes, made to order with a choice of ingredients – opens in the former Baguetier location. Across the street is the hip Shorebreak Hotel where you can treat yourself to a sit-down brunch with a Bloody Mary or beer flight and south of the border favorites Huevos Rancheros or Chilaquiles (American faves also on the menu) on the patio at Zimzala’s while taking in a view of the pier and all the action beachside. Zimzala, Shorebreak Hotel, (714) 960-5050. Update 7/1/17 – Zimzala is reimagined as Pacific Hideaway under Kimpton, new owners of the Shorebreak Hotel. 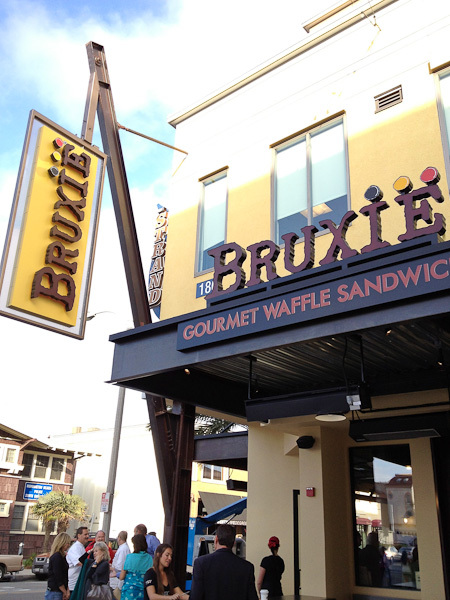 A little further up 5th Street – you can’t miss their bold sign – is Bruxie. 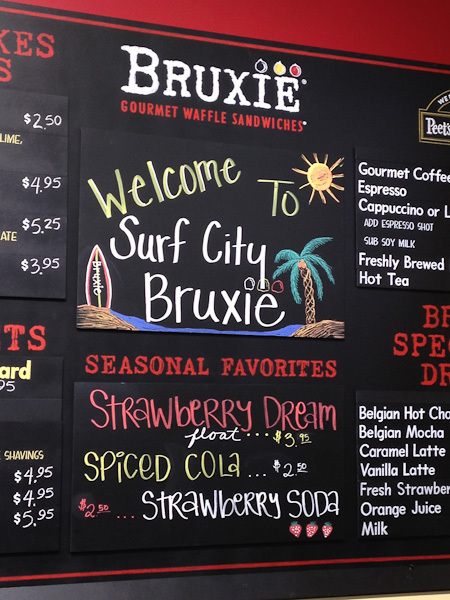 Bruxie’s new take on the authentic Belgium waffle has taken Orange County by storm – it’s light, crisp, yeasty and not sweet (although they do have dessert Liege waffles that are sweet and irresistible!). 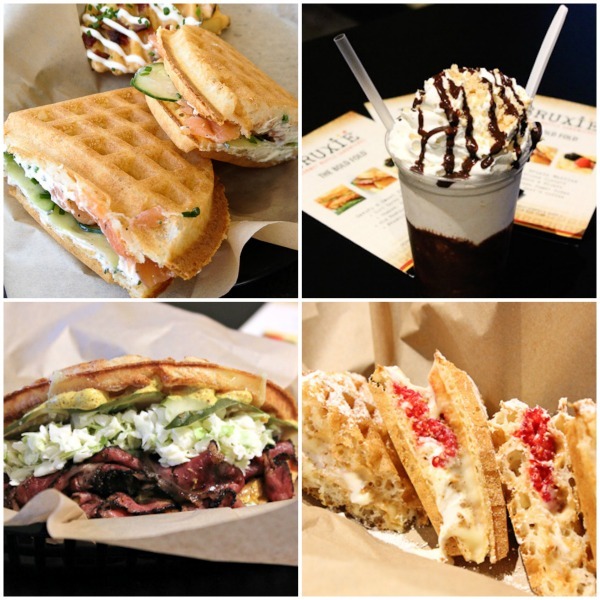 Get in on the waffle craze with a Green Eggs & Ham Waffle or a Smoked Salmon Lox and Dill Cream Cheese Waffle – or dive right into lunch with the ever popular Buttermilk Fried Chicken & Waffle or Pastrami Bruxie. Killer shakes, Wisconsin custard and drinks available at the walk-up window, too. Bruxie, 180 5th Street, (657)215-3559. 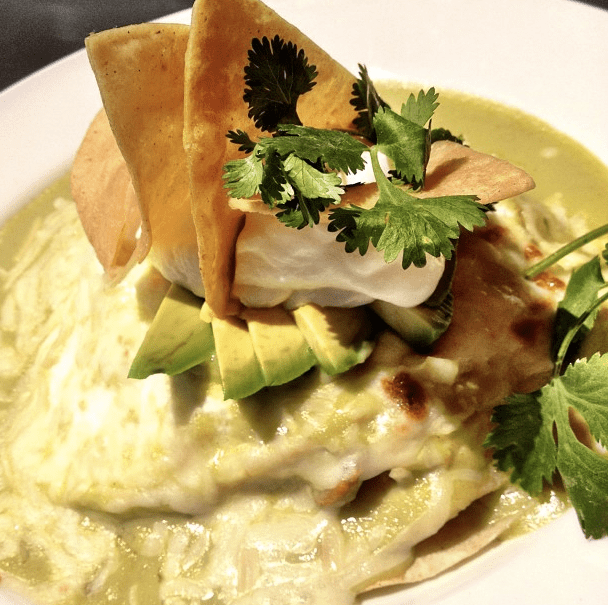 That’s it for now – next up, fish tacos and the best seafood around!